Midway through Horace McCoy’s1 1938 Hollywood novel I Should Have Stayed Home, the novel’s protagonist Ralph Carston, a naïve Southerner, movie extra and aspiring Hollywood star, wakens to find a total stranger standing by his davenport. The man, who is still sobering up from a bender the previous evening, is Johnny Hill. Hill explains his drunkenness as the result of his celebration the evening prior having quit his job at Universal where he was a publicity agent. He then proceeds to provide a rather befuddled Carston with the evidence, which he reads from a movie column published from “that great reactionary journal” (McCoy 59) the Los Angeles Times. The conversation is cut short with the entrance of Mona Matthews, Carston’s roommate, who reveals she is the reason that Hill is there, having brought him home with her after a party the night before. As Carston gropes to understand Hill, Matthews humors him, already having heard his story twenty times; but for both characters in Hill’s world, politics and a righteous sense of artistic integrity are alien. Carston and Matthews are instead focused on the minutia of their situations and the realities of their own day-to-day existences of making ends meet, paying rent and surviving in Hollywood. In light of the subject matter of McCoy’s novel, it is difficult not to see it and its artistic intentions through the lens of Hill. I Should Have Stayed Home, however, is today remembered as only a minor work by an author anthologized in crime and noir collections, such as The Library of America’s Crime Novels: American Noir of the 1930s and 40s (1997), an author who is best known for Sidney Pollack’s 1969 film dramatization of McCoy’s 1935 book about marathon dancers, They Shoot Horses, Don’t They?, starring Jane Fonda, Michael Sarrazin and Gig Young. 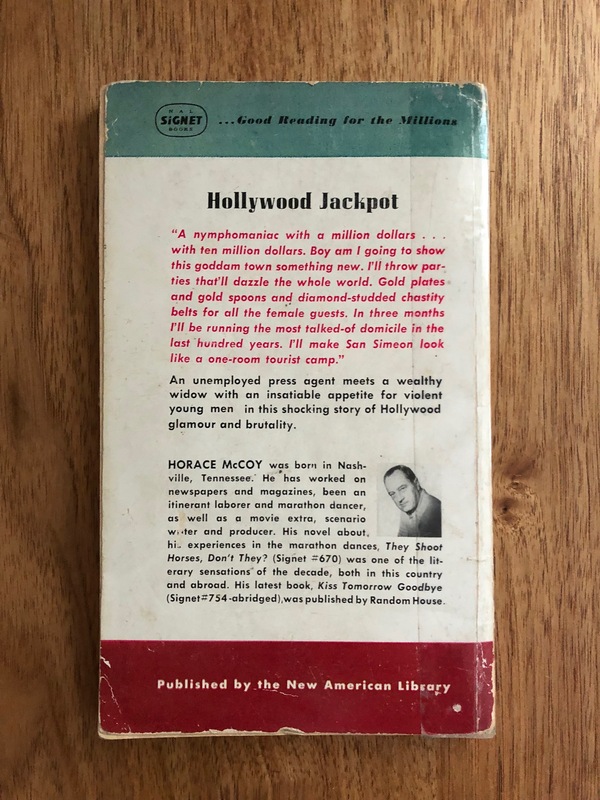 Spoken by Hill and written by McCoy, the book that would fulfill the promise of the Hollywood novel, at least as it is canonized today, would be Nathanael West’s Day of the Locust published in 1939. Other better known examples of Hollywood fiction from the era would follow suit, including Fitzgerald’s “Pat Hobby” stories published between 1940 and 1941, his posthumous The Love of The Last Tycoon: A Western (1940) and Budd Schulberg’s What Makes Sammy Run? (1941). But it is West’s Day of the Locust, that still lives on today in our collective consciousness in the form of Homer Simpson. For Laura Rattray, I Should Have Stayed Home is forgotten due, in part, to the novel’s initial critical reception. In his famous essay about California fiction, “The Boys in the Back Room,” written between 1940 and 1941, critic Edmund Wilson would more or less dismiss the novel completely. Wilson’s criticisms aside, when considered alongside other examples of Hollywood fiction, McCoy’s work, writes Rattray, “predates many of the ‘classic’ Hollywood novels and, as previously noted, their now familiar themes.” (14) For Rattray, one of the most recognizable of these themes is found in the character of Ralph Carston, the “impossibly naïve” (15) man-child, also identifiable in West’s character of Homer Simpson. As a Southerner, Carston’s accent, the talent agents tell him, renders him useless to the pictures. It is not only Carston’s accent that is at odds with Hollywood but his old-world attitudes as well, which are most apparent in his hard-to-swallow racism and his paradoxical worship and disgust with the characters and their mores who populate the Golden Land. If Carston can be said to offer a template for the innocent abroad, then Hill provides a representation for the image of the writer himself in Hollywood. This image contrasts rather starkly with the image of the writer in Hollywood as an artist in Hell, the riches of his mind plundered and squandered by the studios, today mythologized in works like the Coen brothers’ film Barton Fink (1991). Hill is an opportunist, with an eye for publicity, a story and plain old money. With the conclusion of the novel, Hill drops the plans to pen the great Hollywood novel altogether when a better gig arises and he moves in with Ethel Smithers, a rich nymphomaniac. When Carston and Matthews remind Hill of his yet-to-be-written masterpiece and other projects, Hill dismisses them. “Don’t forget about the picture you are going to make,” Mona said. Hill’s prophecy becomes a double one. 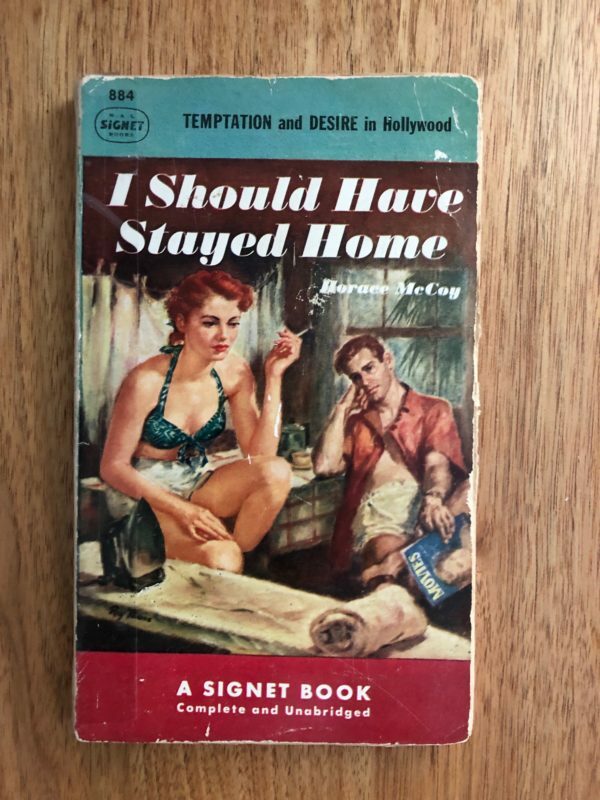 Someone will yet write the great Hollywood novel, and McCoy’s own book I Should Have Stayed Home, a complex and insightful portrait of Hollywood and the characters who fill it, is today sadly forgotten and not discussed nearly enough. McCoy, Horace. I Should Have Stayed Home. New York: Signet Books, 1951. Rattray, Laura. “Cinematic License: Editorial Influences on the Hollywood Novels of Horace McCoy.” Papers of the Bibliographical Society of America 102.1 (2008): 77-94. Wilson, Edmund. “The Boys in the Back Room.” Classics and Commercials: A Literary Chronicle of the Forties. New York: Vintage Books, 1962. 19-56. The cover made it look like vintage erotica. That magazine the guy is reading on the cover looks good.